Trivandrum, 1 December 2011: Grand Kerala Shopping Festival GKSF 2011 has been inaugurated by Chief Minister Oommen Chandy at Marine Drive, Ernakulam today. The festival, managed by Government of Kerala, is on its fifth edition will be held on almost all parts of the state till January 15, 2012. The festival offers guaranteed prize for each purchase in the form of scratch 'n' win coupons and gift vouchers. A Mega prize up to 101 kilogram of gold is the main attraction. 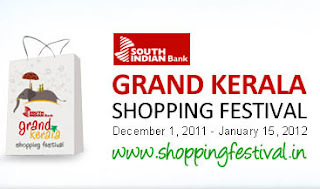 Also GKSF will be providing 100% VAT refund for the consumers from outside Kerala. The inaugural event will be followed by perfomances by Jayaram, Kalabhavan Mani, Harishree Ashokan, Swetha Menon, Shamna Kasim, Sudeep Kumar, Afsal, Sayanora, Anwar SAdath, RAjalakshmi, Kalabhavan Navas, Ramesh Pisharadi, Leslie Lewis etc.